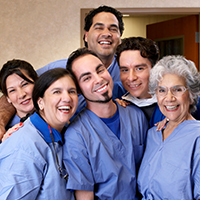 Being a part of HCA Healthcare, our HCA MidWest Health hospitals provide unprecedented career opportunities. Grow your nursing career with an HCA MidWest Health. Join our new Market Resource Pool where you will have the opportunity to float to our different hospitals around the Kansas City area based on the facility needs. We are currently looking for candidates with at least one year of experience to join our new team. Our Market Resource Pool opportunities include full-time, part-time and PRN openings in a variety of settings including Med Surg/Tele, Critical Care, Operating Room and Emergency Department. HCA Midwest Health's Market Resource Pool provides experienced RNs the opportunity to have flexible scheduling, leadership opportunities and premium pay rates. We are also offering a $5,000 sign on bonus for qualifying candidates. Ask your recruiter for details! If you are looking for an opportunity for professional growth and advancement, then we'd love for you to apply to our open Market Resource Pool openings. For us, it's all about people. At our HCA MidWest Health hospitals across the Kansas City area, you will find that caring extends to both our patients and our people. We are committed to advancing nursing across the organization by nurturing our nurses through education, professional development and defined pathways for personal and professional growth. Are you looking for an employer with many different career options and a people-focused culture? You’ve come to the right place. Being a part of HCA Healthcare, HCA MidWest Health, provides unprecedented career opportunity including the ability to move within 178+ hospitals and 1,800 sites of care located in 20 states and the United Kingdom.